Want to Learn about Stevia? Don’t you wish you can had something other than the BLUE, PINK, YELLOW packets or even the plain sugar packets to put in your coffee, tea or any where else you wish to have a little sweet stuff? Well, the answer is here!! And it has been here for a while, but the FDA (see articles below) had been banning it from the U.S. for 10 yrs. I am talking about the wonderful natural herb called, “STEVIA”. We all have a craving for a sweet taste and often satisfy this craving with sugar or fat foods. Even "natural" sugar substitutes, such as honey, maple syrup or molasses, can be unhealthy if over-consumed since they can markedly elevate blood sugar levels. For this reason, it can be advantageous to practically everyone whose diet contains sweeteners. Although it can be helpful to anyone, there are certain groups who are more likely to benefit from its remarkable sweetening potential. These include diabetics, those on diets or want to reduce caloric intake, and children. If you're a parent, you can take advantage of the many recipes provided in this Cookbook, Cooking with Nature's Calorie-Free Sweetener. It will provide your children with tasty sweets that will satisfy their sweet teeth but not cause damage to the teeth. Obesity in children is a growing problem in this country and any method we have of helping children reduce their caloric intake will be greatly beneficial. We also are concerned with children over consuming excessive amounts of artificial sweeteners. The potential, long-term health consequences of saccharin (“Sweet ‘n Low”), aspartame (“Equal”), sucralose (“Splenda”) ingestion are currently not fully known. Eliminating all artificial sweeteners is frustrating because it is virtually in every product we buy. However, by substituting stevia in homemade desserts and other recipes and drinks, you can significantly reduce your children's exposure to these artificial chemicals. See Stevia Cookbook. And, of course, DON’T BUY PROCESSES FOODS. It is one of the most beneficial plants on earth and is used throughout the world as a no-calorie sweetener. Native to Paraguay, the leaves of the plant have a delicious and refreshing taste that can be 30 times sweeter than sugar. What whole leaf of this plant does both inside the body and on the skin is incredible. It is a small green plant bearing leaves which have a delicious and refreshing taste that can be 30 times sweeter than sugar. Quality leaves and whole leaf concentrate are nutritious, natural dietary supplements offering numerous health benefits. This DEFINITELY the sweetener of the future. Because the human body does not metabolize the sweet glycosides (they pass right through the normal elimination channels) from the leaf or any of its processed forms, the body obtains no calories from this sweetener. It can be 70-400 times sweeter than sugar. Other names used are called Stevioside, Rebaudioside, Extract, or Concentrate. If they are in their pure unadulterated form they do not adversely affect blood glucose levels and may be used freely by both diabetics and hypoglycemics. For people with blood sugar, blood pressure or weight problems it is the most desirable sweetener. You can stir it into your coffee, tea, or add some to your bowl of cereal. The possibilities are endless. I have added to recipes that ask for sugar. There has never been a complaint in any of its consumable forms, has caused any harmful side effects in the 1500 years of use in Paraguay and about 20 years in Japan. Scientists who have studied it state that it is safe for human consumption. This natural sweetener is safely consumed by hundreds of millions of people around the world, with absolutely no adverse health effects. It’s as safe as drinking tea. And compared to the dangers of aspartame, sucralose, saccharin, and other chemical sweeteners, it is by far the better choice. Consumer health advocate Mike Adams, a long-time supporter of this sweetener, replied, "The FDA has been stalling on its approval for well over a decade in order to protect the profits of aspartame," Adams said. "It is safely used around the world by hundreds of millions of consumers with absolutely no problems, while aspartame is tied to seizures, blindness, headaches and other serious neurological problems. The FDA once ordered the destruction of books containing this natural sweeteners n recipes. That's how desperate this criminal organization is to protect the profit racket of aspartame," Adams concluded. Are All Products the Same? No. The best products are the Paraguayan products derived from the whole leaf . The refined Chinese Stevoside products are only 81–90% pure and some samples have found to be contaminated with pathogens. For smart addition to YOUR healthy lifestyle use these two great companies Steviva Brands, Inc., SweetLeaf. I buy from both companies. They produce the highest-quality, best-selling products in North America. They start with the finest organic leaves and use an all natural aqueous (water based) extraction process. The result is an intensely sweet and smooth flavor that both carry a 100% satisfaction guarantee. If for any reason you are not 100% happy with any of their products, send them back for a full refund. The plus in SteviaPlus is the addition of insulin fiber (ROS) – a premium-grade, naturally occurring, soluble fiber that is found in chicory, fruits and vegetables. Inulin fiber helps nourish the friendly bacteria (lactobacillus and bifidobacteria) in the intestines and may provide many health benefits. SweetLeaf® is available in convenient packets or powder form. 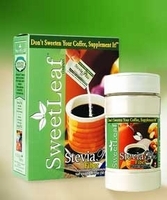 Sweetleaf® also offers "SteviaClear", a liquid form for sweetening beverages and other products for cooking. Suggested Use: Add 1/2 packet to supplement unsweetened beverage, or use sparingly to supplement desired food preparations. Reduce sugar usage by 1 teaspoon for each teaspoon of SweetLeaf "Plus" Fiber used. Equivalencies are approximate. Adjust to your taste. Ingredients: Frutafit Inulin Fiber (FOS), Extract (standardized to a minimum of 90% Steviosides). Remember: Due to high fiber content of this produce, when adding it to a liquid, stir liquid first, then pour product in and continue to stir. I buy 100 packets of SweetLeaf "SteviaPlus" for my coffee and on the go. Also, I buy the 1 lb. Steviva for cooking and baking. Unlike artificial sweeteners, the sweet glycosides do not break down in heat which makes Steviva an excellent sweetener for cooking and baking. Steviva the Controversial Sugarleaf Unleashed – August 4, 2008. Natural Sweetener Steviva Loaded With Antioxidants; Protects Against DNA Damage, July 30th, 2008. FDA Threatened Celestial Tea Company over Use of Natural Sweetener Steviva by David Gutierrez NaturalNews.com, January 31 2008.